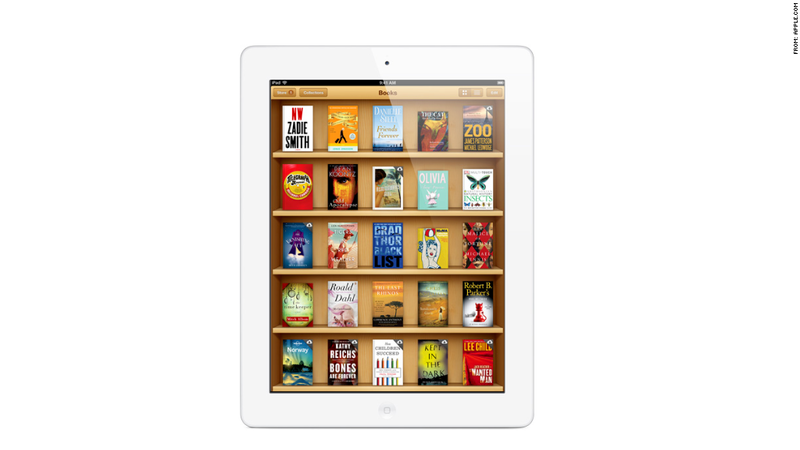 Apple conspired with five publishers to raise the prices of e-books, a judge ruled Wednesday. A federal judge ruled Wednesday that Apple conspired to raise the prices of e-books. The e-book publishers at issue -- CBS's (CBS) Simon & Schuster, Hachette Book Group, Pearson's (PSO) Penguin Group, Macmillan and News Corp.'s (NWS) HarperCollins -- settled and didn't go to trial. Apple (AAPL) held out, and the U.S. Department of Justice brought a civil antitrust suit against the company in 2012. The DOJ alleged that Apple and the publishers engaged in a "conspiracy" to team up against Amazon and fix the price of e-books -- and Apple was the ringleader of the deal. "Apple not only willingly joined the conspiracy, but also forcefully facilitated it," Judge Cote wrote. "This price-fixing conspiracy would not have succeeded without the active facilitation and encouragement of Apple." In response to the ruling, Apple said it was simply giving consumers more choice in the e-book market, "breaking Amazon's monopolistic grip on the publishing industry." "Apple did not conspire to fix e-book pricing, and we will continue to fight against these false accusations," said Tom Neumayr, spokesman for Apple. "We've done nothing wrong and we will appeal the judge's decision." Publishers hated Amazon's discounted price structure, under which the retailer set the prices for e-books. Amazon sold many titles for $9.99 each, a price publishers thought was far too low. Apple entered the e-book market in 2010 with the launch of the iPad -- and that's when, the suit alleges, publishers saw a way out of Amazon's "wholesale" pricing. Apple offered the five book companies an "agency model," in which the publishers set their own prices and Apple took a 30% cut off the top. Judge Cote didn't buy those arguments. "It is no defense to participation in an illegal price fixing conspiracy to suggest that others did it too," she wrote in her ruling. "A meeting of the minds to raise e-book prices by working together could not be more clear from this record." Cote said Apple orchestrated a conspiracy by telling the publishers that the company would only move forward with the agency model plans if it had a "critical mass" of publishers on board. Apple also made sure to include a clause saying publishers on Apple's platform had to match the lowest price found elsewhere -- including that of Amazon. Those agreements, called "most-favored nation" clauses, aren't inherently illegal under antitrust laws -- but Cote said Apple illegally used them to "effect an unreasonable restraint of trade." Apple kept all the publishers apprised of its negotiations with their competitors. The judge said in her ruling that Apple's negotiations served as the linchpin for the conspiracy, promising all the publishers that they would get "identical terms ... in every material way." That, combined with the company's other actions, violated U.S. antitrust laws, the judge said. As a result, e-book prices went up across the board for consumers. A few days after Apple inked its own deals with publishers, Amazon (AMZN) backed down and allowed e-book prices to rise to about $12.99 to $14.99. Cote said she'll schedule a hearing to discuss possible damages. Apple will likely appeal the ruling.